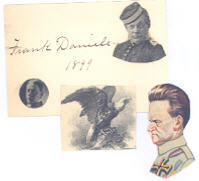 The actor and singer Frank Daniels was especially as a comedian very successful both on stage and in movies. After a singing education he made his film debut at the Gaiety Theater in Bostonin 1876, it followed appearances in plays as well as light operas. To his well-known plays belong "The Chimes of Normandy" (1879), "A Rag Baby" (1884), "Princess Bonnie" (1895), "The Wizard of the Nile" (1895), "The Office Boy" (1903) and "The Belle of Brittany" (1909). Frank Daniels came to the film in 1915 and he created successful characteres like Captain Jinks and Mr. Jack for Vitagraph Company. To his first movies belong "Crooky" (15), "Captain Jinks of the Horse Marines" (16), "Mr. Jack Ducks the Alimony" (16), "Mr. Jack Inspects Paris" (16), "Captain Jinks Should Worry" (16) and "Captain Jinks' Hidden Treasure" (16). In the next years came many other movies into being, most with the figure Captain Jinks. To these movies belong "Captain Jinks' Dilemma" (17), "Captain Jinks' Love Letters" (17), "Captain Jinks' Alibi" (17) and "Captain Jinks and Himself" (17). Frank Daniels acted at Harold Lloyd's side in his last years in the film business called "Count the Votes" (19), "His Only Father" (19) and "Pay Your Dues" (19). After the movie "Among Those Present" (21) - again with Harold Lloyd - he retired from the film business.